Support Center Pro Created by DAEXT. 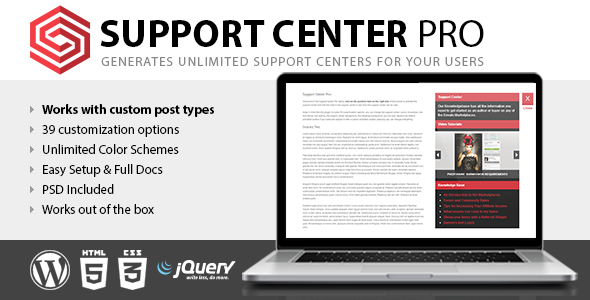 This templates have specific characteristics, namely: Support Center Pro is a new WordPress plugin that allows you to create custom support centers for your users, so they can have an easy access to your documentation or have specific tips related to the displayed . You can use this Support Center Pro on WordPress category for center, centre, client, customer, customer support, documentation, help, online, online help, support, support center, support center wordpress, support centre, support system, system and another uses. Support Center Pro is a new WordPress plugin that allows you to create custom support centers for your users, so they can have an easy access to your documentation or have specific tips related to the displayed content. With Support Center Pro you will be able to create support centers related to specific posts, pages, custom post, or alternatively a single support center ( not associated with specific posts, pages, custom posts ) that will be used throughout your website. First of all, Support Center Pro make use of a new custom post type “document” and the related taxonomy ”class” useful to organize your documents, hence you should use this new custom post type for your documentation. Then proceed to the actual creation of the support center, the Support Center Pro meta box will be available in your posts, pages, and custom posts and is organized in three different areas, general documentation, standard documentation, media documentation. This plugin comes with 39 customization options, so you can change every single pixel displayed in the support center. Activation Button Image Open (60×62): This image replace the default open activation button. To replace the default activation button with your custom images you should set both this option for the open status and the close option below for the closed status. Custom Post Type 1: If you are using custom post types and your purpose is to show the support center in your custom post types here you can set the custom post type slug to enable the support center. If for example you are using the “product” custom post type set “product” here and your users will be able to access to the documentation related to your products. You should use this method only if your purpose is to create a single generic support center displayed throughout your website. The generic support center can also be used as a fallback, in order to have a generic support center if there are no specific support centers. To create a generic support center you have to enable the “Use in Template” option in the Support Center Pro meta box and paste the related function just before the body tag of your theme, usually located in the footer.php file. Do you care about your website’s SEO? Improve your internal links structure and get more visits on your WordPress website with the Interlinks Manager plugin.